The annual next@acer event took place yesterday evening in New York. As usual Acer showcased an appealing range of PCs in various form factors pitched at various markets. For me probably the highlight of the array of products was the Acer Predator Helios 700 gaming laptop featuring the "unique Hyperdrift keyboard for increased thermal performance". Other interesting PCs included the ConceptD range of machines (and a monitor), plus some Nitro laptop refreshes and a new Chromebook. Acer unveiled two new Predator Helios gaming laptops, the Helios 700 and Helios 300. The high-end Helios 700 debuted Acer's unique HyperDrift forward-sliding keyboard that helps maximize airflow to keep the system running cool and quiet. As the keyboard slides forward to use extra air intakes are uncovered and the palm rest comes into angled position. Inside the cooler's main components are 4th Gen AeroBlade 3D Fans, five copper heat pipes, a vapour chamber and Acer CoolBoost Technology. This machine will appreciate the cooling as it comes packing a 9th Gen Intel Core i9 processor, and up to Nvidia GeForce RTX 2080 GPU. Other specs include; up to 64GB of DDR4 memory, and Killer DoubleShot Pro with Killer Wi-Fi 6 AX 1650 and E3000. Other gaming niceties are the per-key RGB lighting, anti-ghosting, and MagForce WASD keys. The Helios 700 is a 17-inch laptop and its FHD IPS screen refreshes at up to 144Hz, with a 3ms response time. Players of fast paced titles might be glad to hear the screen uses Nvidia G-Sync technology for smooth performance. Complementing the visuals are five speakers and a subwoofer for punchy audio. 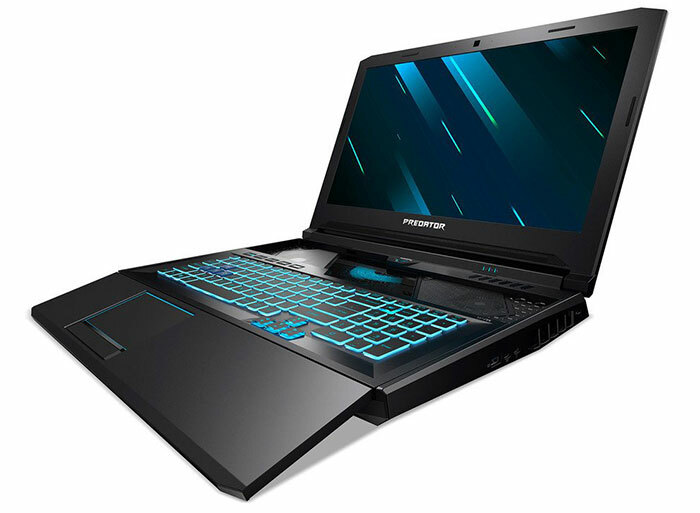 The Predator Helios 700 gaming notebooks will be available in North America in April starting at USD 2,699.99; in EMEA in July starting at EUR 2,699.00. Acer's "midrange" Predator Helios 300 gaming laptop is also based around a Full HD IPS 144Hz 3ms display, this time available in 15.6- or 17.3 inches. It is still very powerful with up to a 9th Gen Intel Core i7 processor, Nvidia GeForce RTX 2070 GPU with Max-Q Design, Killer DoubleShot Pro for fast and lag-free networking, up to 32GB of DDR4 2666MHz memory, and up to two PCIe NVMe SSDs in RAID 0 plus a hard drive. The two Predator gaming laptops above were joined by other kit at the event last night, such as the Predator Orion 5000 desktop, the Predator CG437K P 43-inch 4K UHD VRR gaming monitor with VESA Certified DisplayHDR 1000 certification and 144Hz Refresh and active sync compatibility, the Predator Galea 311 gaming headset, the Predator Cestus 330 gaming mouse, the Predator Aethon 300 mechanical gaming keyboard, and a 17-inch laptop backpack. 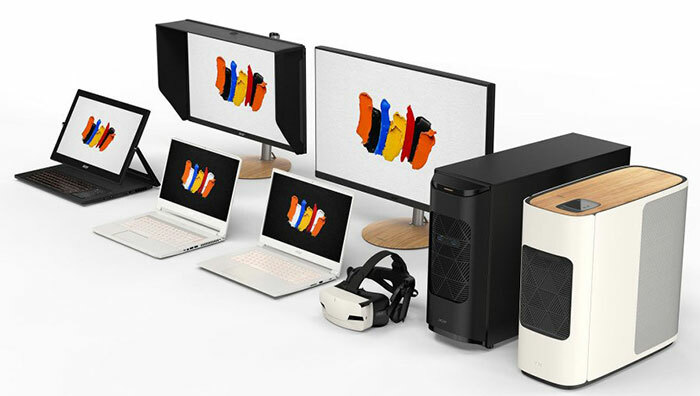 Concept D is a new Acer sub-brand for desktops, laptops, convertibles, monitors, and Windows Mixed Reality headsets for creators. These are stylish yet modern and powerful PCs and components. Jerry Kao, Co-COO, Acer Inc explained "as the foundation of a full line of creator products, we've designed PCs with high-performance processors and graphics that can handle extreme workloads, and put them inside quiet, minimalist designs to inspire creators to unleash their creativity." The highlight of this range is an Ezel hinged convertible called the ConceptD 9. We have seen this hinge mechanism used previously by Acer since the R-Series convertibles it debuted back in 2014. 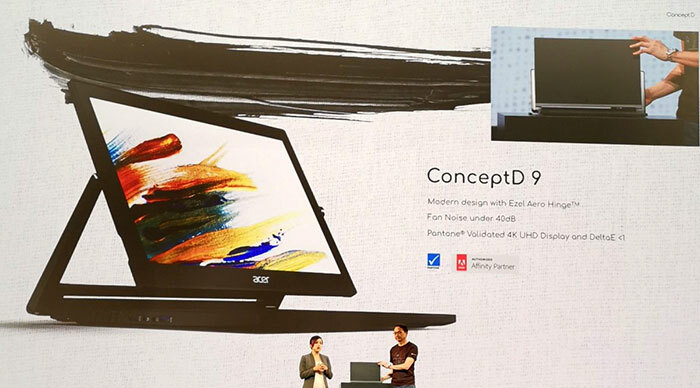 The components are very much up to date in the ConceptD 9 though, which features up to a; 9th Gen Intel Core i9 Processor, Nvidia GeForce RTX 2080 Graphics, a Pantone Validated 17.3-inch 4K UHD Display w/ 100 per cent Adobe RGB and comes with a Wacom EMR Pen (4096 levels of pressure). Acer's ConceptD 9 also comes with and up to 32GB of DDR4 memory at 2666MHz and two 512GB M.2 PCIe NVMe SSDs in RAID 0. The ConceptD 900 will be available in North America in May, starting at USD 19,999; in EMEA in June starting at EUR 17,999. A couple of more conventional laptops, the ConceptD 7 and ConceptD 5, are based upon Intel Core i7 processors, and up to RTX 2080 Max-Q or Radeon RX Vega M GL graphics, respectively. These are both slim and light designs with 4K UHD Pantone Validated displays. The ConceptD 7 / ConceptD 5 will be available in North America in April, starting at USD 2,299 / USD 1,699 ; and in EMEA in July, starting at EUR 2,299 / EUR 1.699. Acer offers a couple of ConceptD desktops too, with up to dual Xeon Gold 6148 processors, and Quadro RTX 6000 graphics, as part of this new creators range. Rounding off the range, there are two new Pantone Validated monitors and the new ConceptD OJO MR headset too. The full next@acer event also included new products as part of the TravelMate and Nitro laptop ranges and Acer Chromebooks. You can watch the full recorded livestream (embedded below) or visit the dedicated microsite for more information. That 43 inches 4k monitor seems interesting. I hope we got more news about it soon! Indeed… if only someone could think to clean it out, eh? Seriously, it won't be a problem. I've had enough slider phones and similar mechanisms on things to know it's pish-easy to just dust, brush or air-dust every once in a while.